Extremely thin and lightweight, as somewhat expected, but nice for price! Filters light wonderfully but the ivory color has too much yellow in it. Do not buy this color if you have white window frames, it just looks dirty. These blinds arrived in great condition and were simple to install since we were replacing window treatments that were left by the previous owners and had all the screw holes to guide our placement. The installation is a simple bracket system that allows the blinds to click into position. The blind material is an ivory polyester; the photographs are very close to the actual color of the product. Many rooms in our house are pale, neutral yellow with ivory trim so the color of these blinds fit seamlessly with the rooms - so well, that after ordering two sets to replace broken/old blinds we liked them so much that we ordered three more sets to replace blinds that we had no intention of replacing. The light filtering has completely transformed the rooms where we installed these - the soft light quality has really made the rooms glow. The cordless mechanism is convenient and functions well. Having cordless blinds was not a priority or even a consideration but after using them for some time they are really nice. This is not a high-quality roman shade. I bought these to use as a base and placed my own fabric on top. 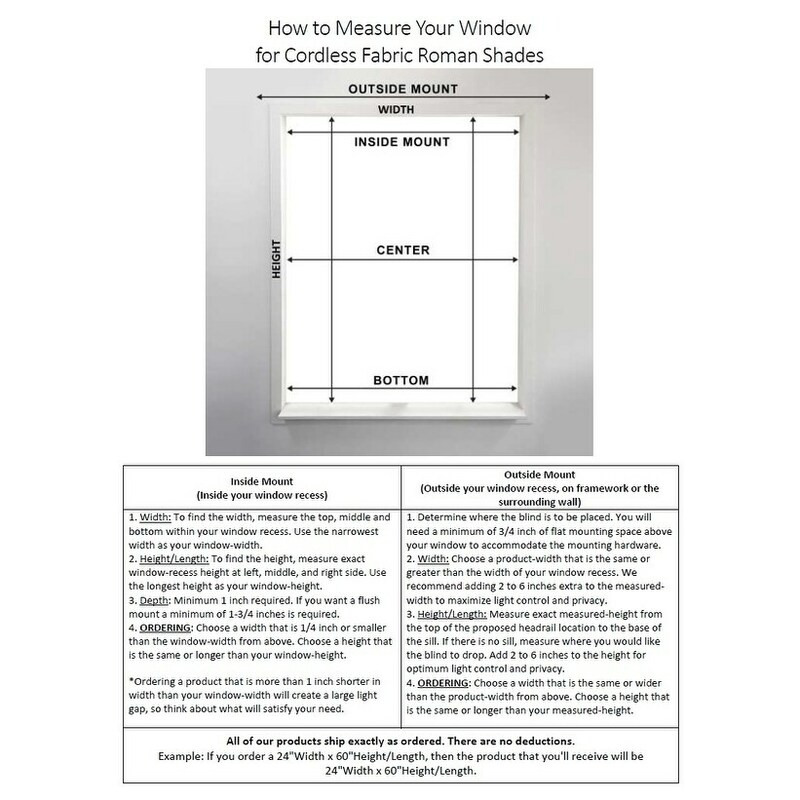 If you're looking for a DIY roman shade to dress up, these are perfect! They have a convenient cordless feature which I love. This is a good "entry level" blind for someone who doesn't want to spend the money on a custom fit or an expensive fabric. Installation is pretty straightforward. We did end up getting the white instead of this color, as the ivory was overly yellow for us. I would suggest that ivory would be good only for truly warm interior colors (e.g., true beige, yellow, etc. ), and not gray, which is what we have on our walls. They are light and easy to install, easy to use. I like the amount of light that filters through. At the same time they provide privacy. I really like the shades. Great item! Very Happy with this purchase. I ordered two of these shades for a guest bedroom. It is a lower level room and I wanted something light in order to make the room as bright as possible, as well as something that would provide privacy. I am extremely happy with these. They are a soft vanilla color, not yellow. You can't see through them, but they are very light and airy. Just what I wanted. Husband installed them both in about 5 minutes. The brackets screw in and then the shades snap on to the brackets. Simple. The blinds are great. I wanted a clean uncluttered look that would also provide privacy if needed--these delivered that. They ivory was true to picture and matched my existing side drapes. I installed them under mount inside the window. Very easy to do despite not so good instructions! I will be ordering more. Terrific shades at a terrific price! I ordered these shades for my office and guest bedroom. They are a warm vanilla/cream color and add a nice subtle treatment to the windows. They offer some privacy and soft light filtering. They were easy to install and seem decent quality for the price. Would purchase again. These Cordless Fabric Roman worked perfect in my space , I highly recommend, easy to install and easy mechanism to go up and down. Love it. These look a little like the sheer polyester curtains my grandmother had back in the 60s--they don't look like cotton or canvas and they do let a lot of light in. They are easy to install and they work pretty well. So, for what I paid, they'll do. Looks nice but failed in 3 months. I carefully measured my windows and these blinds fit perfectly. They weren't hard to install. They were just right, a nice pale color with just enough light filtering. However, after 3 months one tore, the cord that operates the blind failed. I contacted customer support and was told " I am so sorry for the inconvenience caused". However, when I pressed them, they agreed to replace the item and allow me to return the broken one free of charge. I hope the second one lasts longer. They must be handled very delicately! I purchased these roman shades for our new home a few weeks ago. They were for my 92 year old mother's bedroom. Since she doesn't need the bedroom to be dark for sleeping these are great and look very pretty. I'm very happy with them and also really like the cordless feature which works great for her. This is the first time I've had that and were a little concerned how it would work but it's great. Looks great, couldn't be happier! These are perfect, they look great and work great! The ivory color is nice and creamy and looks great with Antique White Trim! I had been wanting new shades for the living room. I do not have curtains on any of my windows. Upstairs I have blinds. I saw these and thought I would try. They are amazing. They looked great in my formal dinning room on my French doors. I replaced my Bamboo shades with these. Oh my Goodness.....the room is brighter and inviting. I even bought new shades for my formal living room. I would recommend this product. These were easy to install and are of good quality. The light filtration allows enough light to shine in but still prevents your neighbors from seeing in. I am overall pleased by their appearance and functionality. Beautiful shade for the price. Easy to install and nice color. Love these blinds. They are perfect. Great quality. They are easy to lift and lower and keep the light out of the bedroom until I am ready for it to come in. These blinds are very nice, easy to put up and easy to use. The blinds keep out the cold air and are great at darkening the room. Would highly recommend these blinds. Very delicate. It's better on a window you leave alone so that you don't run the risk of skin oils that could stain it. Not great for privacy but pretty. LOVE this shade, exactly what I wanted. Great customer service! Brackets broke during installation and replacement parts arrived within 3 days of reporting the issue. These blinds look great, but they don't stay up well. I've wished for a cord so many times as the blind just doesn't stay at the level I want it. I wouldn't buy this again. "I am looking to put blinds on my french door to office. Can I mount them to a door with no window frame? How many screws does it take to mount?" Yes, you can mount these to a door--that is considered an outside mount. 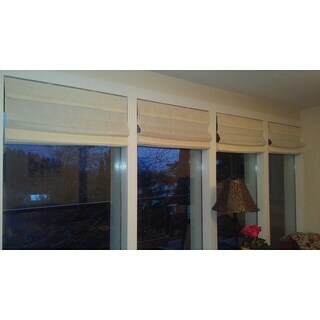 These shades come with universal hardware that is used in both inside and outside mount applications. They can be back or top mounted. Usually, you will be using about 4 screws to affix the mounting hardware. "Why doesn't the description state how these blinds are mounted? I need them to mount to the top of the window sill, not to the sides. Can you please confirm?" Yes, these shades can be top mounted. "I need 41.5 wideth blinds; will these works?" 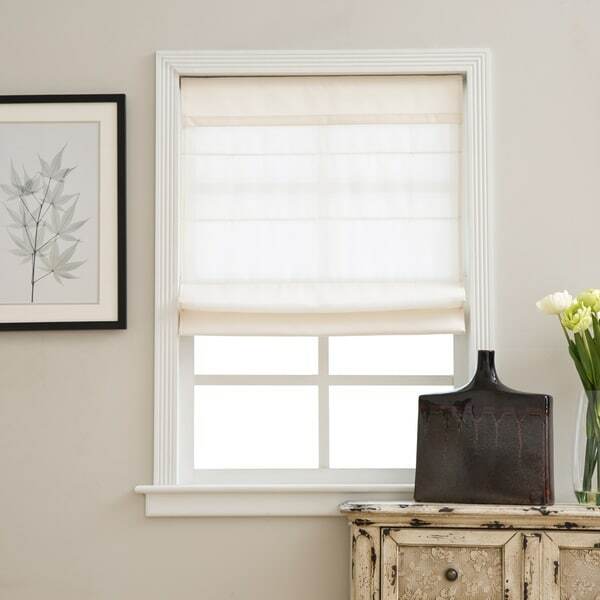 We recommend that you order shades that are at least 1/4" smaller then your window opening. We recommend ordering your shade at least 0.25 inches smaller then your window opening. If you are planning an outside mount you can order at your desired width. "Can these shades be mounted outside the window on the wall instead of inside the sill?" Yes, these shades can be mounted as an inside or outside mount. "I have a 33 inch wide window. Should I order the 32.5 inch one?" The 32.5-inch shade may be your best option as it will fit in your window with the smallest light gap. "Is it possible to get a sample of shade color,I am not sure exactly what will match." "How deep is the bracket? I would like to layer a bamboo blind over them inside mount?"